Kobi Karp Architecture and Interior Design (KKAID) have been in the business of designing living spaces for over two decades. Known for adaptability, the firm’s versatility is evident in their various projects. In terms of height, no other firm has such a drastic disparity between some projects versus others. 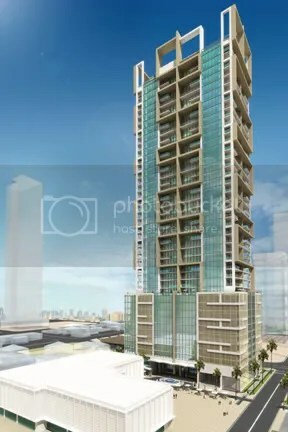 KKAID is responsible for having designed the 1,200 foot tall Empire World Towers, which will, if finished, be among the tallest condominiums in the world and Miami’s first 1000 footers. Kobi Karp is helping lead the way in designing Uptown’s new leading high rises. 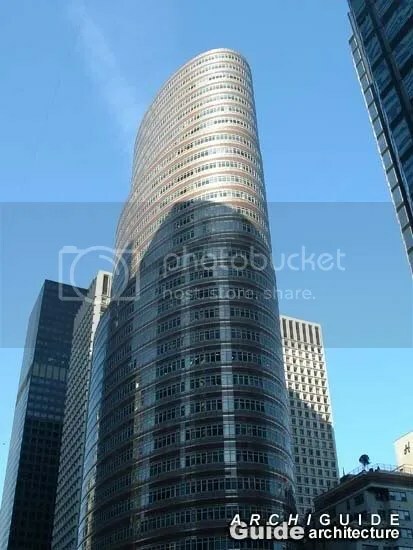 The 649ft Chelsea, 473 ft Lima, and 437ft Park Lane tower are good examples. 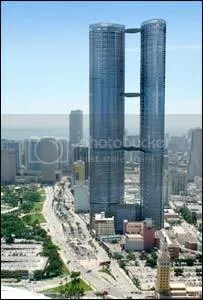 Their influence extends to Brickell Village as well with their 794ft Flatiron and 849ft 1101 Brickell Tower, which is a Leviev Boymelgreen project. Much of their bread and butter work is seen on Miami Beach and North Bay Village. By “bread and butter” I mean those projects which fill in the firm’s portfolio but don’t get much attention from the masses due to lack of height. The Lexi, Mei, Bel Aire are good examples. In analyzing some of the firm’s designs you will realize that there is a sense of dynamism that makes each design seem truly unique. It is hard t find clear parallels in their designs. This distinguishes KKAID from other firms which tend to develop a certain signature style that is incorporated into most of their designs. The implication is that KKAID executes the vision of the client rather than their own. It is hard to imagine such versatility in a vast portfolio such as theirs. They pull it off though. KKAID buildings have character, whether tall or small. In viewing the Bel Aire, for example, which is not altogether tall, the design still makes great use of glass, has interesting jagged façade patterns, and a highly distinguishable crown. All these elements come together to give the Bel Aire an air of importance that compensates for its low stature. The Lima building is my favorite Kobi Karp product. The structure has a multi-tiered terrace façade with parallel sharp vertical glass lines. 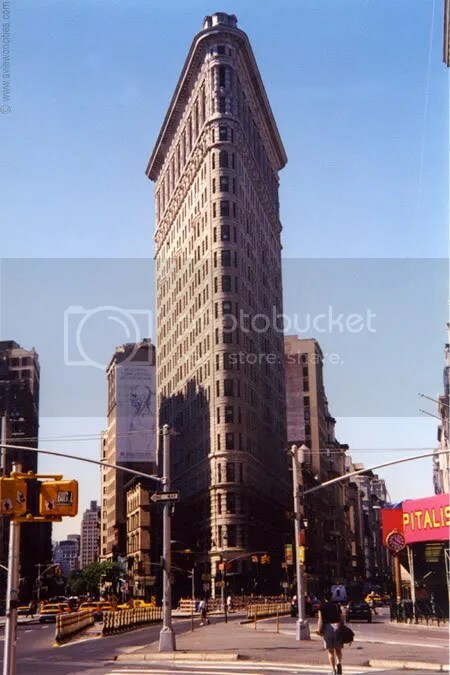 The Flatiron, with its curvilinear design creates a unique modern adaptation of the New York City urban icon. Too bad it’s not likely to get built. 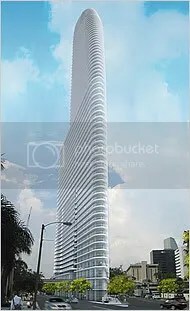 The 1101 Brickell development, and to a lesser extent, the Flatiron resemble the Lipstick building in New York City. 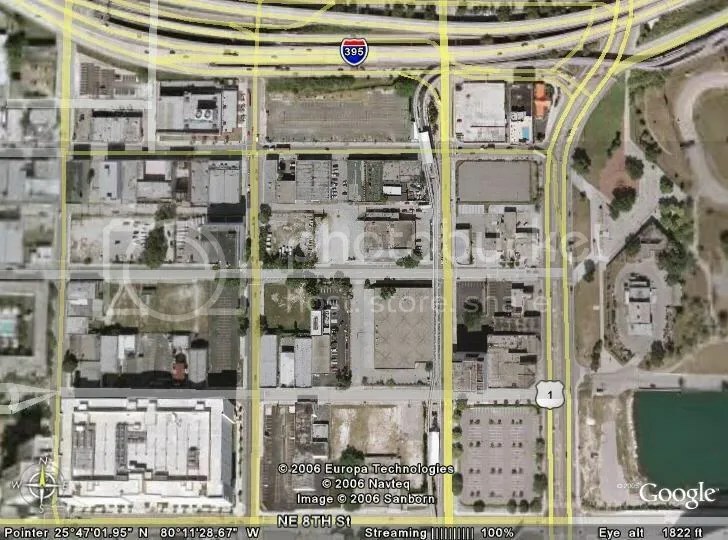 In comparing a rendering of both Miami developments to the Lipstick Building you’ll see that the resemblance is uncanny. Whether KKAID was inspired by the NYC icon is not known but, in my opinion, implied. The Aja and Element projects do resemble one another in slight ways but these similarities are to be expected and in no way compare to some Chad Oppenheim projects, which look like copies of one another (Element, Ice, and 10 Museum Park). 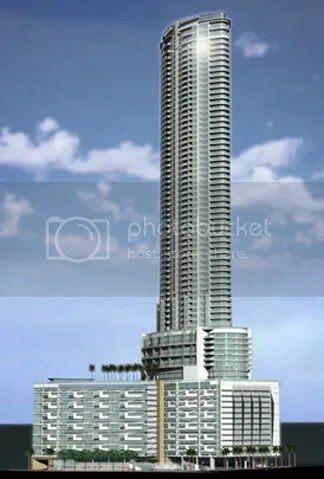 Personally, although I am very much pleased with the notion of having two 1000 footers in Miami, I am not exactly satisfied with the Empire World Tower’s dark and plain design. I do, however, appreciate the three sky bridges that connect the two monolithic structures—something that is seen in Cesar Pelli’s Petronas Towers—, which again implies that KAID is outward looking when searching for design inspiration. Kobi Karp continues its legacy of adaptability and dynamism and the firm seems to draw inspiration from other national/international urban landmarks thus providing a global perspective that is incorporated into their designs. More of the skyline should be illuminated at night. Seeing an illuminated crown or building façade doesn’t just make the building look better but the entire skyline as well. For the perfect example, one only needs to look at the Bank of America Tower. 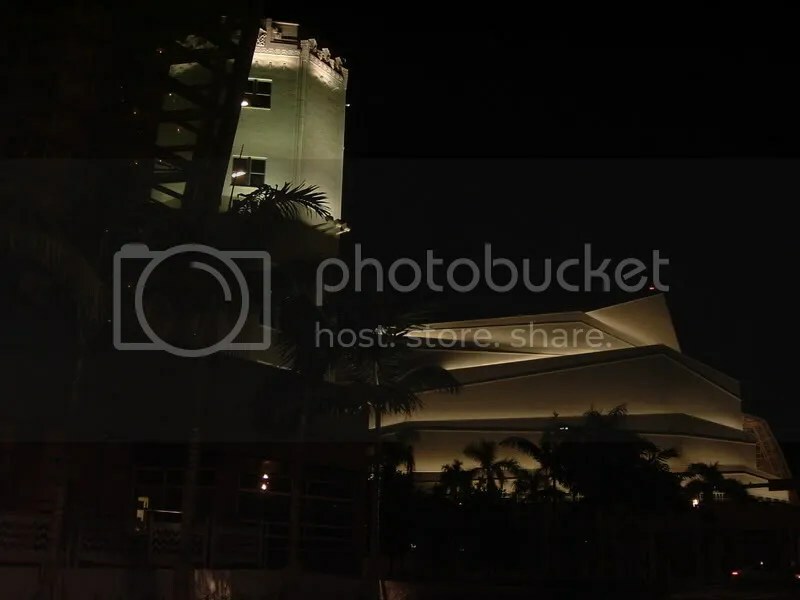 This curvilinear multi tiered 600-plus foot tall wonder rules over Miami’s night sky. 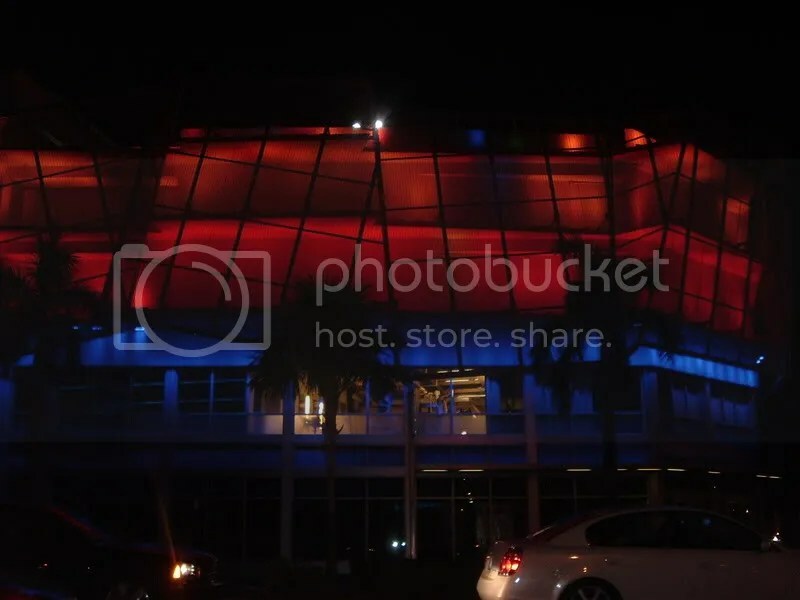 The building’s colors change with the season, holidays, and sometimes special events. 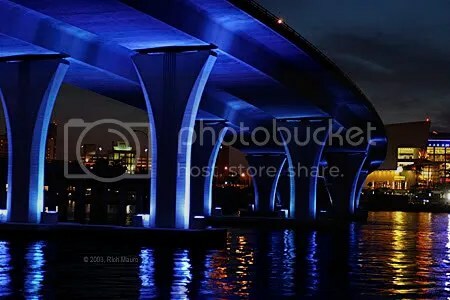 Its beams of light reflect the city’s nightly buzz and energy. Everyone notices. It is the most photographed building at night, and much to my delight, other more subtle imitators have lit up the night sky. 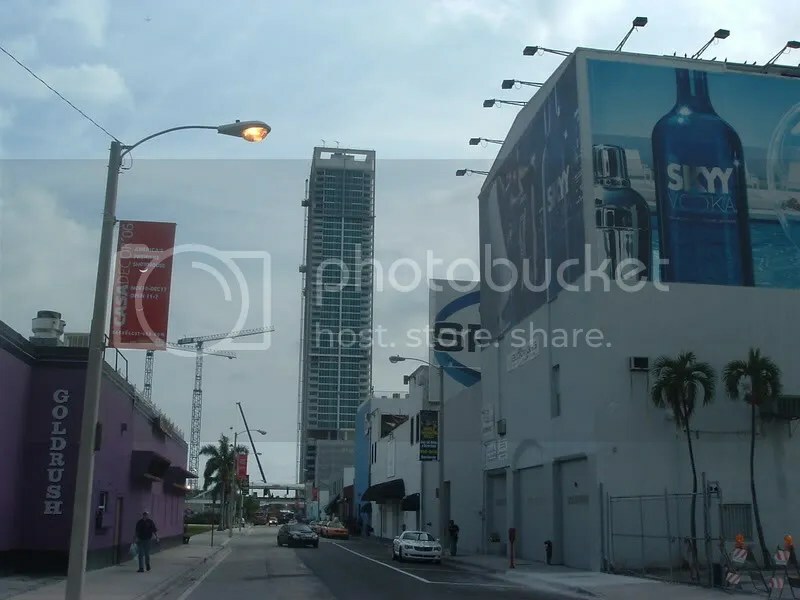 Take Vue, in Brickell Village, for example, with its illuminated blue crown and lower pedestal. Vue is not exactly awe inspiring. It doesn’t have the most eye-popping design and it isn’t situated on the most conspicuous lot, but darn it the crown is lit. So, I notice it. It provides a positive addition to the Brickell Village evening skyline. 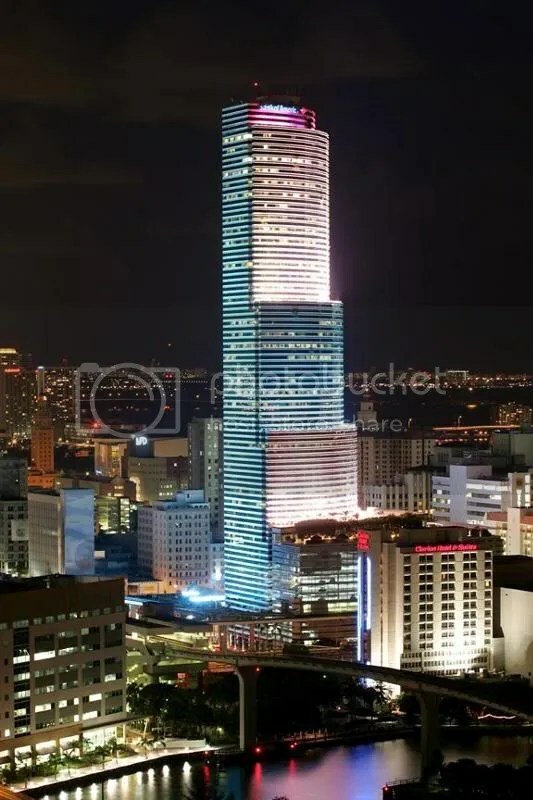 For a while, Skyline at Brickell had its crown illuminated in a light blue. It looked great, but lately I haven’t seen it lit—maybe the condominium association doesn’t like the electricity bill. Brickell has its fair share of lit up towers. The Espirito Santo’s front façade is illuminated and looks great at night. Atlantis just recently began to illuminate the pyramid top of their building. This whole pattern is not new but has grown as of late. 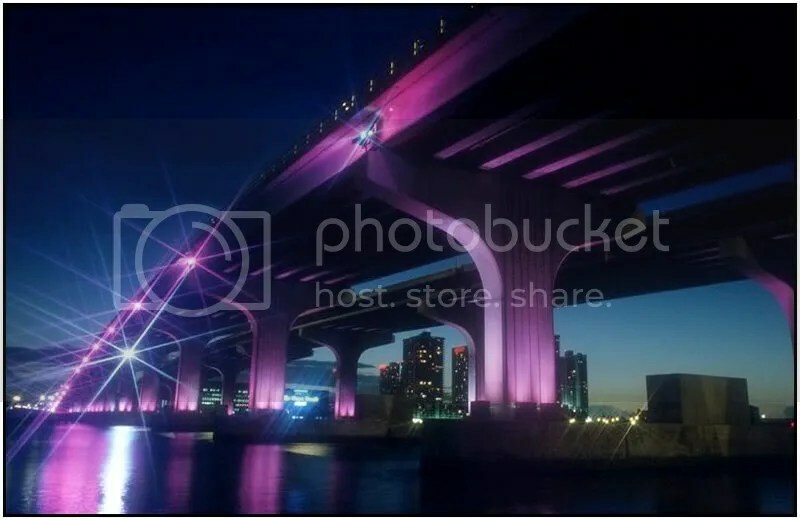 The most important contribution to this trend was the illumination of the Port of Miami Bridge in blue lights and the Macarthur Causeway in purple lights. Now, with the advent of the illuminated Carnival Center for the Performing Arts (which I suspect will, like the BOA tower, probably display multiple colors although currently white is it), the whole city will take on a new nightly radiance. Across the bay in South Beach it is much more common to see illuminated structures. Most of the Art Deco structures have some type of colorful lighting scheme. The Lincoln movie theatre complex and the 500 Block of Collins are both kaleidoscope-like at night (thanks to Zyschovich). The Flamingo Tower’s crown is illuminated in blue, the Waverly has vertical yellow and blue lights, and the Bentley Bay has blue lights vertically dotting its curvy sides. The Delano, Fontainebleau II, Shore Club, and National hotels all have illuminated crowns. What seems to be clear is that Miami is a city of colorful lights now, but given the expanding pattern of structural illumination and the rampant new development, the future will likely hold an astounding array of illuminated towers and structures that will reflect the city’s vibrancy, paint restless reflections on the bay, and create a luminous urbanism that will further set Miami apart. As the condo market cools, what happens to projects that haven’t broken ground yet? Portico in Miami is one of those. The Cameo Apartments still stand on that site, occupied now by vagrants and drug addicts. NEW RESIDENTS: A squatter shoots up in a unit at the Cameo Apartments, whose renters were ousted to make way for a condo high-rise, which hasn’t materialized. 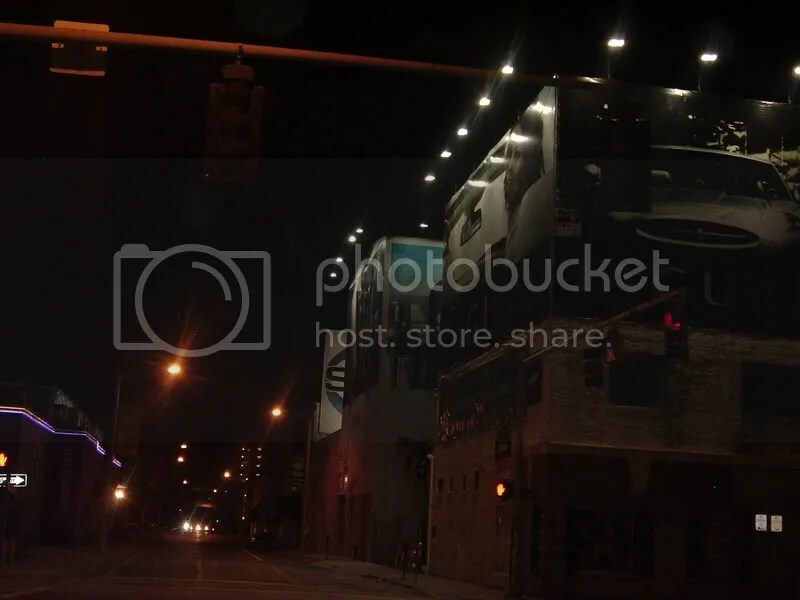 Slide show | Inside the Cameo Apts. The once spotless apartment is a gutted shell now, a place where junkies shoot up and urine saturates the carpet beneath layers of fast-food wrappers, tangled window blinds and broken glass. Five months ago, it was the tiny but pin-neat home of Martha Pomare and her two boys. Now, the only trace of the former occupants is the white paint on the walls. 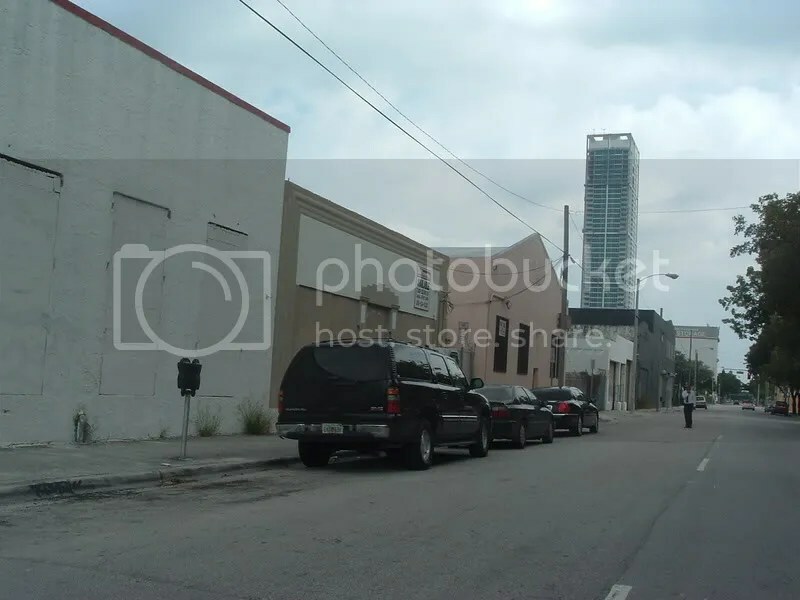 When the residents of the Cameo Apartments, 1825 NE Fourth Ave., were forced out in June by development plans, they found themselves on the dark side of Miami’s condo-building boom, which gobbled up affordable housing in favor of glitzy new high-rises. But the Cameo still stands. Nothing new has been built there. Vagrants and addicts have moved in, and the building has been stripped of salvageable metal down to the light sockets. Last month, the city issued a notice of code violations to the owners, including failure to board up a vacant building. And a for-sale sign has appeared in front of the Cameo for the property and the right to develop Portico, the 324-unit condo project approved for the site. All around the dilapidated Cameo, new condo towers are nearing completion. But Miami’s overheated real-estate market has cooled, and projects that haven’t broken ground face increasingly difficult conditions. The future of those projects — Portico included — remains in question. And there is interest from others, too, he said, but the inquiries are not coming at the same frenzied pace as during the height of the boom. The big question is how long until the rebound, said Miami real-estate analyst David Dabby. 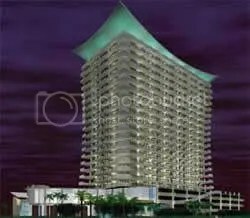 Right now, there are thousands of new condos and more coming onto the market at a time of reduced demand. Many planned projects have stalled, he said. In many cases, those projects already had cleared out rental apartments and knocked the buildings down. ”If they had known the projects were going to bog down, they would have kept the buildings and collected rents to offset taxes,” Dabby said. 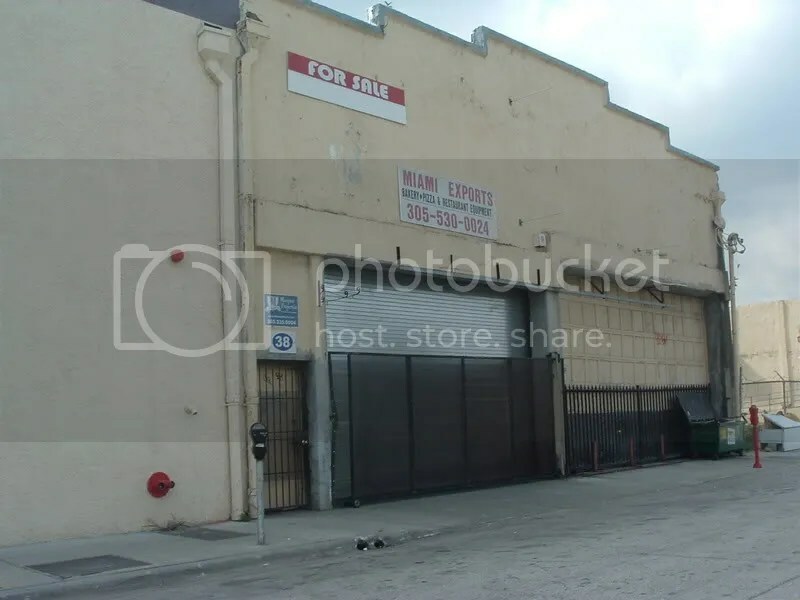 At the Cameo, Dominguez has to deal with squatters instead of renters, and now he has code violations as well. He said his company will demolish the building. City officials said no hearing date has been set on the code violations, which Cameo Apartments Ltd. had until last Tuesday to correct. The company asked for a 30-day extension to interview demolition companies. For the former residents of the Cameo, it will be a relief when the building finally comes down. It stands as a reminder of the afternoon they found notices on their doors giving them less than three weeks to move. A new condo was taking the building’s place. The tenants, who had no leases, received their deposits back and ultimately were allowed to stay in their $500-a-month apartments for up to six weeks without paying rent. Dominguez said his company, which bought the Cameo in 2004, allowed renters to stay in the apartments for two years without raising their rents while the Portico project was being planned. But the search for new homes was still a mad scramble. Some ended up paying more than they could afford for new rentals in the tighter market. Others doubled up with roommates or left the state. ”Jiminy Cricket, all that fuss to get us out of there and nothing’s been built,” said Sharon Frank, a retiree and music minister who now lives in an apartment 11 blocks north of the Cameo. She peeked into her old apartment recently when she saw the door open. Another former resident, Malika Kabbouchi, who helped her neighbors by finding a lawyer to represent them for free, said she continues to drive by the complex, waiting for signs of construction. Inside the Cameo, the newest residents are sleeping off last night’s high. Nearly every apartment has been vandalized. In one, green garbage bags filled with trash are piled in the middle of the living room. In another, a wall is smeared with feces. Larry, stretched out on a lounge chair in a second-floor apartment, keeps headphones on to drown out the construction racket. He has lived in the complex ”a couple months,” he said. He’s 52, from Boston originally, and works three nights a week, for $7 an hour, parking cars downtown. Is it dangerous to live in a room with near-strangers, no windows and no privacy? He shrugs. Martha Pomare, the former tenant who lived a few doors from the apartment where Larry now sleeps, says that learning what has become of the complex stings. Miami Herald staff writer Matthew Haggman contributed to this story.